This is a replacement for the Febco 765 Pressure Vacuum Breaker Backflow Device. It is after-market, and it is more durable and less expensive than OEM. 1. Rinse all parts with clean water prior to reassembly. 2. Do not use any grease, oil, or solvents on parts. 3. Do not force parts. Parts should fit together freely. Excess force may cause damage and render the assembly inoperable. 4. Carefully inspect seals and seating surfaces for debris or damage. 5. After servicing, repressurize the assembly and test to ensure proper operation. NOTE: Turn On Water Slowly to Re-pressurize. Less expensive than original manufacturer replacement parts. Extremely durable PVC replacement for Febco 765. Replacement Kit for Febco 765 1 inch Backflow Pressure Vacuum Breaker Assemblies. 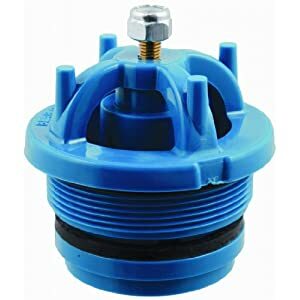 Bought this as a spare to have if the backflow preventer in my new house ever breaks. We tried it at a neighbor’s who’s breaker was damaged in the freeze last winter. Worked perfectly. Drop it in and turn the water on. Word of caution though: wear clothes you don’t mind getting wet because water comes gushing out of the valve for a second before the breaker engages. Don’t turn the water on slowly. Move the water cut-off handle fully to ON as quickly as possible. It takes full water pressure to compress the spring. 1. 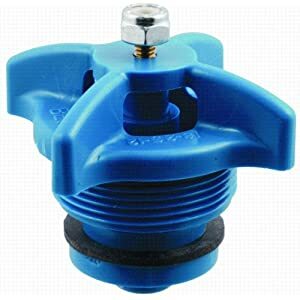 Turn off the supply valve (bottom handle) by turning it until it is perpendicular to the upright Febco 765 Backflow Preventer. 2. Remove the Febco 765 bell cap by unscrewing the nut on top. 3. Remove the old (usually broken) Febco 765 bonnet and poppet assembly from the Febco 765 Back Flow Preventor valve. If it is broken, there will be a few plastic parts that will have to be dug out, and the bonnet will have to be unscrewed from the Febco 765 Backflow Preventor. 4. ONLY REMOVE THE PLASTIC AND RUBBER PARTS. Do not remove the brass platform below the Febco 765 bonnet and poppet assembly. 5. Order a Febco 765 pressure vacuum breaker replacement bonnet & poppet assembly. 6. Carefully inspect seals and seating surfaces for debris or damage. 7. Rinse all Febco 765 repair parts with clean water prior to reassembly. 8. Do not use any grease, oil, or solvents on Febco 765 repair parts. 9. Do not force Febco 765 repair parts, as they should fit together freely. Excess force may cause damage and render the Febco 765 Backflow Preventer inoperable. 10. Install the new Febco 765 Backflow Preventer Bonnet and Poppet Assembly replacement by screwing in clockwise. 11. Replace the Febco 765 bell cap and nut. This can not be replaced separately. 12. After servicing, repressurize the assembly by opening the supply valve SLOWLY and test to ensure proper operation. NOTE: The supply of water is pressurized differently in all cities, and many cities do not have pressure regulators. If you open the supply valve too quickly, it can cause damage to the Febco 765 replacement bonnet and poppet assembly or the housing.